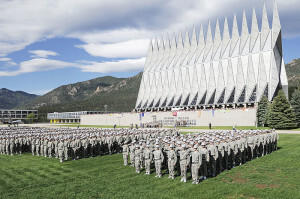 COLORADO SPRINGS — The United States Air Force Academy in Colorado has decided to make the phrase ‘So help me God’ optional in its cadet oath after an organization that fights for the separation of church and state lodged a complaint with officials. As previously reported, the situation began when the academy sent photographs of its new prep school to a local newspaper, which included a snapshot of a poster that contained the honor oath. A writer at the newspaper sent the photograph of the poster to Mikey Weinstein, the president of the Military Religious Freedom Foundation, who in turn filed a complaint with the Air Force Academy. Weinstein says that mandating the phrase “So help me God” violates the United States Constitution. In a discussion Wednesday evening on FOX’s Kelly File with Megyn Kelly, Weinstein was asked why he would not support allowing an opt-out for some cadets. He asserted that the phrase needed to go altogether because it is unlawful. While the poster was taken down in response, the academy’s Honor Review Committee also met to discuss Weinstein’s concerns about the oath itself. On Friday, it released a statement outlining that the committee has decided—as Kelly suggested on her broadcast—to make “So help me God” optional in the oath. “The fact that the oath is optional will be communicated in honor lessons, leadership lessons, and religious respect lessons during the summer (cadet basic military training) so all trainees will understand prior to taking the Cadet Honor Oath that the final clause will be completely optional,” Major Brus Vidal outlined further to reporters. He stated that the person administering the oath, the Cadet Wing honor chair, will also have the option of whether or not to mention God. But Weinstein says that he is unhappy with the outcome of the decision as he believes the phrase should have been discarded completely. “If the words are still there and you don’t say [them], you turn yourself into a tarantula on a wedding cake,” Weinstein also remarked to CNN. However, prior to the announcement, some expressed concern that the Air Force Academy might indeed decide to remove God altogether because of Weinstein’s influence.